Even though part of our trip is family related, we were still able to enjoy a couple of meals out in Edmonton. For lunch today we checked out Taipan, a Chinese HK style restaurant located in Chinatown. Upon arrival to the restaurant the clientele is partly Asian and play Caucasian. The menu offered a selection of soup noodles, congee, chow mein, and rice dishes. They also offer main dinner Chinese dishes such as hot pots, sweet and sour pork, and vegetarian dishes. They have another menu offering all day breakfast specials HK style and lunch special soup noodle and rice dishes that come as as combo with drink. We met up with a friend of mine that moved to Edmonton from Vancouver. My bf and my friend ordered the same dish, wonton and brisket in soup noodle with drink. I ordered a preserved vegetable and sliced pork with vermicelli in soup with a side plate of gailan and oyster sauce. The noodles were quite flavourful but the gailan was a bit raw tasting. My bf said his noodles were the standard noodles, nothing too special. After some afternoon shopping we went to Piccolino Bistro, an Italian restaurant famous for their spicy mussels, cannelloni, and pasta. As we went with my bf’s family, the four of us ordered 4 dishes to try. Because their mussels are a house special, we had to order that – mussels cooked in a special spicy tomato sauce with 2 pieces of garlic bread. 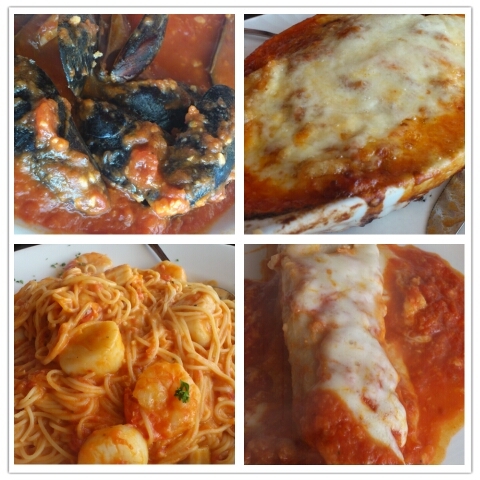 We also ordered a cannelloni Piccolino – their signature cannelloni consisting of veal wrapped in pasta with a tomato sauce, the Penne Di Mare but substituted the Penne with Angel Hair Pasta (with shrimp and scallops) in a tomato sauce, and the lasagne, a giant baked cheesy dish of meat and pasta. The portions are large so best to share. They also include bread to start – best to save those to use to dip into the mussels’ spicy tomato sauce. Overall the quality of the dishes are fairly good. My favorite was the mussels. However, the cannelloni order originally came out wrong (they have two different cannelloni dishes – one with a tomato sauce and the other with a cream/wine sauce) so we had to rush for them to get the right order baked and back out to us. I found the cannelloni hearty and the veal was really well seasoned, however a little tasty. They were nice enough to split it for us for sharing so that we each got one cannelloni plated instead of the original two on one plate. The angel hair di mare obviously had a bit of butter in the dish when sauteeing the scallops and shrimps, but quite a hearty dish in general. The lasagne was big! I like coming to Piccolino Bistro for dinner, however, I was a bit disappointed to see flies on the windows and flying around in the restaurant, bothering diners as they eat. A tip for the owner is to put in some measures to prevent the flies from distracting the diners. It’s a bit unappetizing when the setting is quite nice and the food is of great quality.